The northbound coach charges into the night. Not a word can be heard; the roaring of the motor provides the soundtrack to an otherwise silent ride. Sporadic signs—temporarily visible via the bus’s headlights—break up the shadows lining the Pan-American Highway. I squint every time one of these lonely markers pops up to try to find out how many kilometers remain until Alausí. 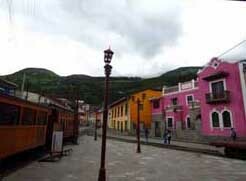 Nevertheless, I only catch destinations like Riobamba, Ambato, and Quito posted. My anxiety grows. My other half and I departed from Cuenca five hours ago, which, according to my guidebook, is the approximate time it should take for this trip. Be that as it may, I’ve seen nothing about Alausí, and the cobrador (fare collector) hasn’t announced our stop. I turn right to check on Alyssa, who is seated beside me in the second row. She is fixed on the opposite roadside. She suddenly leaps from her seat. “What? !” I respond, darting to the front to join her. She knocks on the cab door. It swings open, and we are introduced to a cloud of smoke. The cobrador is holding a cigarette between his index and middle finger. “We want to go to Alausí,” I say. “We already passed it,” he replies. The vehicle slows to a complete stop. Alyssa and I stare at each other. “Well, are you staying or are you getting off?” asks the operator. “The next stop is Riobamba … a little more than an hour away,” the cobrador chimes in. Envisioning the countless wayside shrines I’ve spotted in Ecuador, I refuse to amble on the shoulder of the Pan-American in the middle of the night. “Apúrense!” someone yells from the rear. Hurry up! “Vamos!” another screams. Let’s go! “We’ll get off in Riobamba,” I answer. I glare toward the back while we return to our seats. Alyssa curls underneath her fleece jacket and shuts her eyes. My peepers, on the other hand, are wide open. Interlacing my fingers to the webbing, I rest my elbows on my knees and concentrate on the floor. I do my best to ignore the laughter coming from the beyond the cab door. After what seems like an eternity, the coach gradually decelerates, and the cobrador pokes his head out. Following Alyssa, I give the collector fare for two. He thanks me. I proceed without uttering a word. We step into dreariness. Half a dozen taxis creep back and forth along the dim avenue. I don’t hail one, however, because I have no idea where to go. The only other indications of life come from a few people eating at a nearby food cart. We approach them. “Could you please tell me where a good hotel is?” I inquire. “La Quinta Macají,” a middle-aged cowboy responds without hesitation. “La Quinta Macají?” I repeat for confirmation. I thank the dude and promptly wave down an oncoming coupe. Climbing into the auto, I note that the driver briefly pauses when I tell him to bring us to La Quinta Macají. I figure it takes him a sec to process my nonnative accent. The vehicle veers onto a forlorn boulevard five minutes later. Moving south on Avenida 9 de Octubre, the cabbie abruptly parks in front of a tall white wall, which lines the parkway for a couple of blocks. “La Quinta Macají,” he says, pointing to the bleached barricade on our right. Understanding quinta to be “country home” in Spanish, I hop out expecting to find the door to our fancy villa for the night. “Where’s the entrance?” I ask. “Over there,” the man replies. He nods to a driveway at the end of the pavement. The car speeds off, and Alyssa and I make for the corner. We sadly encounter more obscurity around the bend—there’s no sound, no lights, not a soul in sight. We are in an alley. Returning to the main road, I scan the barrier and spot a wooden sign which reads, “La Quinta Macají.” The name is right, but my idea of quinta, in this case, is wrong. I realize we are frowning at the wall of a large farm. Pissed off because I’ve been duped, I yank my guidebook out of my bag. I frantically flip through its pages till I arrive at accommodations in Riobamba. While I skim the section, my partner alertly flags a taxi she sees on the other side of the divided highway. It turns around at the next intersection. “What is the best hotel in Riobamba?” I inquire through the passenger window. “Hotel Zeus,” the young man answers. Recognizing the name from the book, I let my breath out. I open the back door for Alyssa and follow her into the compact. A left and a right—separated by a few minutes on Duchicela—take us to the steps of Hotel Zeus. Alyssa and I check in, drop our bags in our room, and instantly retrace our steps to the lobby. Starving, we exit the building in search of dinner. We drag our feet along Avenida Daniel León Borja for a couple of blocks in each direction, but fail to locate an open establishment. Alyssa reads her watch and mentions it’s almost eleven o’clock. Back in the hotel, we ask the clerk if the restaurant is open. He must see we are hungry because, even though there are no other employees around, he tells us to have a seat. He trails us to our table. “I can make you some grilled cheese?” he offers. We eagerly nod. The young man, who is not only our server, but also our cook, disappears behind the swinging kitchen door. He reappears with our food shortly thereafter. We inhale the sandwiches. “That’s the best grilled cheese I’ve ever had,” my gal admits with a smile. I agree. Relieved by his kindness, we discuss how the guy could have simply told us that the restaurant was closed. We leave a nice tip atop the tablecloth. We go to lobby to thank him before riding the elevator to our suite. We collapse on our bed. I wake up to hear Riobamba’s Friday is well underway. I open the curtains to pastel structures illuminated by a brilliant sunrise. A cacophony of cars honking, dogs barking, and roosters crowing fills the air while flea-like pedestrians scurry about the sidewalks. Amid the hustle and bustle, I notice buses rolling in and out of the terminal terrestre, which is merely four blocks to the west; an easy commute for a change. We arrive at the depot an hour later. Entering the lot, we immediately identify “Alausí” painted on the side of a red and white bus, which is beginning to pull out of its parking spot. We run to the coach and jump on, plopping into a pair of seats right behind the operator. I grab my handbook. 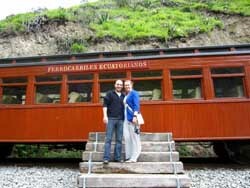 We study up on the Nariz del Diablo (Devil’s Nose) train ride. We can hardly sit still for the next hundred kilometers. Fifty bucks lighter, I hand Alyssa her stub. I follow her to the cement platform behind the depot. We join a camera-flashing crowd of roughly thirty people, varying in age and nationality. At half past ten the train comes into the terminal, and the early risers who caught the 8am hop off. I examine the vintage carriages as we wait for permission to board. Despite their old-fashioned appearance, the timbered wagons shine like new, like someone has recently applied wood polish. My number one and I enter car 1566 a short while later. Ten fellow travelers occupy the seats around us. The charcoal locomotive starts southward at eleven o’clock on the dot. A young guide stands with a microphone. He first speaks in English, then Spanish. He tells us the history of the railroad in the region while the train snakes over creeks, below trees, and between rolling green hills. The hills eventually grow into grassy mountains. And the cliffs to our left inch so close at some points that a daring individual could actually touch the jags through an open window. In the meantime, the view to our right ultimately transforms into a sharp dropoff. Peering into the bottom of the gorge, I notice a red-roofed structure positioned between two trackways. I determine that it must be the Sibambe Station when the train begins its unique descent. I realize we are on the Devil’s Nose. 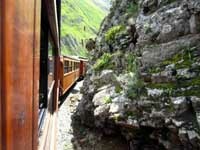 Made possible with a couple of switchbacks, the train zigzags down the steep mount. It starts head first. Passing a convergence in the tracks, the train then reverses down the second stretch of rails before completing the zigzag in a forward motion. At the foot of the peak, the engine chugs well past the Sibambe Station until it reaches a viewpoint. Everyone detrains to witness the Devil’s Nose from afar. For several minutes, Alyssa and I meander about the gravelly lookout with the other sightseers, taking pictures, and taking in the famous Nariz del Diablo. “Where does the name come from?” I ask our guide, who is doubling as a photographer for most of the spectators. He gives me two potential origins. I disagree with the man’s first statement that the mountain resembles a face with a giant snout. But I find his second reason much more believable. 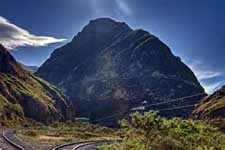 Although a great achievement in engineering (the switchbacks) occurred on it, he says the bluff is referred to as the “Devil’s Nose” due to the many lives lost during the construction of the railroad between Sibambe and Alausí. Alyssa and I climb back on the wagon. The locomotive barely gets moving before it halts alongside the Sibambe depot at noon. Tourists and crew alike shuffle into the cement block building for lunch. After wolfing our complimentary sandwiches, my girl and I ascend a long staircase to the Cóndor Puñuna (Condor Nest) visitor center, which overlooks the station from a nearby ledge. Alyssa ventures inside. I stay outside to absorb the cloudy, yet tranquil scenery. Leaning on the safety railing, I survey the lush valley. I study the brook that swerves through the canyon. I follow the stream until it curves behind a distant cliff. An arm wraps around my shoulder. Quickly descending, we sit on the edge of the tiny souvenir plaza, which borders the base of the steps. 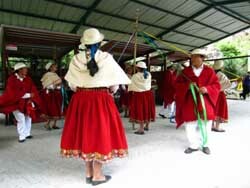 Five men and five women, dressed in traditional Andean clothing, take the concrete stage. The males don white shirts and pants, red shawls, black shoes, and cream hats. The women have similar hats, but sport red skirts to go along with their black flats, white blouses and off-white shawls. Pan flutes fill the air. Each holding a different colored streamer, the performers dance in a loop, twisting the ribbons around a tall wooden pole in the middle of their circle. The women do the second song by themselves. They fold, stretch, and fling their shawls for the entire number. When the music ends, so does our time at the Devil’s Nose. It’s 1:30pm when we arrive back in Alausí. Ready to return to Cuenca, Alyssa and I stroll along Main Street until we reach the terminal. We walk up to a man who is leaning against the depot with his arms crossed. “Where is the bus for Cuenca?” I inquire. I shift my gaze up to the distant Pan-American. My shoulders slump. Alyssa and I jump into the back seat. In the blink of an eye, the cabbie speeds down 5 de Junio and guns his yellow coupe up the hill. He pulls into a gas station right away. “So we just wait here?” I ask while digging some coins out of my pocket. We get out, and the speedster whips a U-turn, descending the hill faster than he climbed it. I watch the winding Panamericana as far as my eyes take me in each direction. I see no autos whatsoever. “Yeah, hopefully a bus comes soon,” I reply. I’m not worried though. We missed this stop less than sixteen hours ago, which led us to being misled and left on a gloomy street in Riobamba. Yet we still found a way to the Devil’s Nose. We are a tenacious team. No matter the twist, I know we will get to Cuenca somehow. We head for the shoulder in front of the service station. We shortly pick up the sound of an engine to the north. It’s getting louder and louder. We stand. A coach suddenly barrels around the mountain. Alyssa, whose vision is clearly better than mine, focuses on the sign in the approaching windshield. I grin when she sticks her pointer finger in the air. One of the first things I did after turning 36 was pull a hamstring. In an attempt to prove to myself and my softball teammates that I hadn’t lost a step, I tried to shift into a higher gear while rounding the bases. I ended up a peg leg instead. Minnesota native Tyrel Nelson teaches Spanish and English in the Twin Cities. He and his wife, Alyssa, are always looking for their next adventure abroad.